Maybe it’s the lack of any kind of Spring this year here in Co. Kerry. 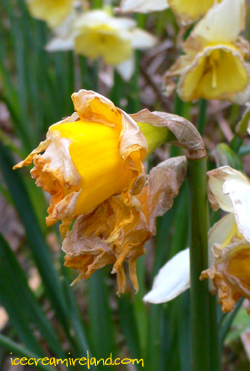 Maybe it’s that the daffodils are dying among hail showers and North winds. Maybe it’s that it’s colder than it should be. Maybe it’s that every time the sun comes out, an astonishingly heavy shower is soon to follow. Maybe it’s simply that I’m tired from a long winter, finishing the book, and a busy Easter in the shops, but I have been feeling in dire need of an inspirationalÂ lift. What did I do? Sun holiday? Yoga? Weekend retreat? No! I recklessly whipped out the credit card and splurged for a Nikon D300. The reviews have been so great and the people I know who have one so happy, that I couldn’t help myself. Hmmm. I’d better keep repeating that! Sometime next week I’ll get a package worth drooling over, and hopefully you’ll see some good results here once I get the hang of it. By the way, I ordered it from Conn’s Cameras in Dublin, who have a good reputation and fantastic prices on certain items at the moment. There has been some grumbling in the press about Irish businesses not passing on the benefits of the fall in Sterling, but Conn’s Cameras has done so in a big way on certain cameras and lenses. They have some real bargains. Hmmm. I’d better keep repeating that! Do Dogs Need Ice Cream? A reader of this blog passed on the following tidbit – there is actually a company that makes frozen treats for dogs. Yes, indeed, Polar Pups in Chicago makes soy-based doggie ice cream. 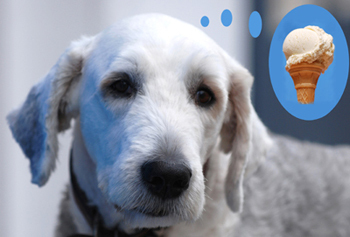 Ivan, the ice cream dog (shown above), has been known to enjoy an ice cream. In fact, he loves to hover outside our shops in the hope of distracted children and dropped cones, so maybe there is something to it. Mind you, I think he likes the actual wafer bit better than the ice cream, unlike the insatiable ice cream cat. I had an excellent surprise – in the middle of a day of proofing the latest version of the manuscript in the office and constantly running downstairs to scoop ice cream during this busy Easter week, I received a present of cupcakes. It was Laura from Eat Drink Live, who was visiting Dingle from Limerick with her wonderful little daughter. And yes! Her baking tastes as good as it looks o her wonderful blog. 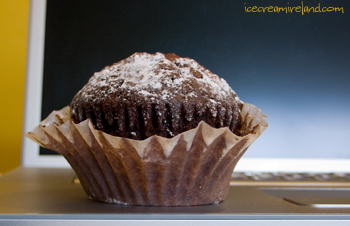 The customers who can buy her muffins regularly at Ivan’s are lucky indeed! Paul O’Mahoney from Siopaeile has come up with this brilliant idea – a collaborative map of places one can buy food directly from farmers or artisan food producers in Ireland. Anyone with a Google account can fill in their favourite haunts or hot tips here, where you can also see it full-size. I think it could be a wonderful resource, so please help out, spread the word and add a few places – it took me only a couple of minutes to add ourselves (shamelessly) and some other Kerry foodie outlets. James Corbett is doing the same thing for Irish WiFi hotspots. Easter is early this year – we’ve hardly finished celebrating St. Patrick’s Day! In fact, Easter can only ever fall on one day earlier, and that hasn’t happened since 1818. The lastest day it can fall upon is April 24th, and that isn’t due to happen until 2038. In any case, it’s definitely March here with a forecast of a cold and blustery weekend. We’ll just have to make the most of it here in the world of ice cream and warm up our customers with good cheer. 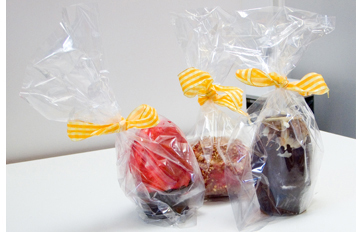 Last year, we tried making ice cream easter eggs, and we made some more this year. If you want to make some, you will need some egg moulds. 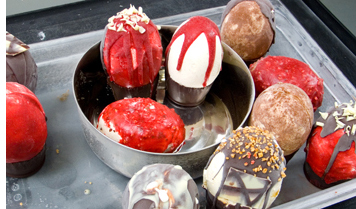 You simply pour the ice cream into the moulds and then decorate them when they are hard. This year, we experimented with dipping them in rasperry coulis, which dyed them a pleasing red. We also sat them in chocolate cups. P.S. Happy news – Lent ends tomorrow! 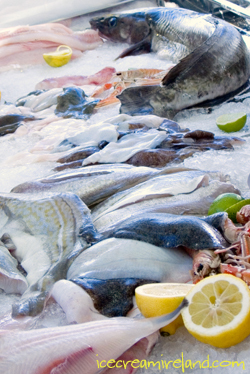 Finally, a Fish Shop For Dingle! I am happy to announce that Dingle has a fresh fish shop for the first time in years. I am so excited! 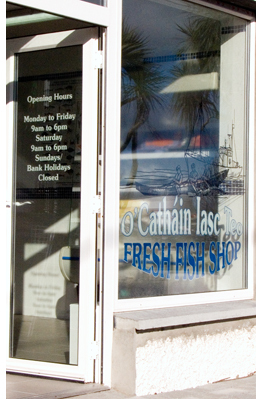 O’Cathain Iasc Teo., on the Quay, have opened a little fish shop right next to their factory. Only open two days, I had to queue behind a few other delighted locals to get my bit of turbot for tonight’s dinner. So, it looks like it will be successful, which is great news. They had quite a range of offerings, and I sincerely wish it brings some hope to Dingle’s struggling fish industry. I certainly will be a good customer! And yes, if you’re heading to Dingle for Easter, and if you feel like cooking, they will be open on Good Friday so that you can get your fish. From the fresh look of it, though, it will hardly be a penance! Happy St. Patrick’s Day! 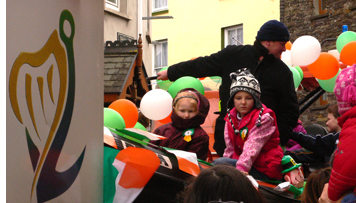 My brother was in our Killarney shop, and I was too busy making coffees and scooping ice cream in Dingle to see much of the parade. I managed to snap a couple of photos in the one lull we had, which are here. There was a great crowd around, and a very good atmosphere. For once, it was actually dry, and although quite windy, no one got wet! 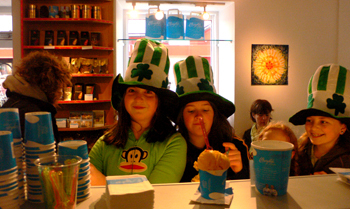 In other news, Ice Cream Ireland has just passed the 100,000 visitor mark, which I feel is a big achievement. I know that some blogs might do that in a day, but I’m quite proud that this site has attracted so many people since its inception. Thanks to all my loyal readers, and long live ice cream! In preparation of the big day tomorrow, you might find this amusing (especially if you’re from the U.S.A.). I wouldn’t suggest pinching anyone, though. Those helpful people at Howcast.comÂ also have videos on How to play the bagpipes, How to make and Irish coffee, and How to throw a Patrick’s day party.